How might generally accepted notions of borders, and related issues of border crossing or containment, be productively questioned or revised within different regional studies contexts as a result of transregional, comparative dialogue? How are questions of belonging, legality, and rights as well as exclusion, violence, and protest affected by the dynamics of borders (whether demarcated as geopolitical and militarized boundaries or cultural and racial boundaries)? What are some of the concrete impacts of technologies of policing as well as technologies of evasion on mobility and confinement? While the geopolitical contexts of the U.S.-Mexico, Israel-Palestine, and Afghanistan-Pakistan borders provide obvious scenarios for scholarly inquiry–as do the North/South Korea border zone and the former East/West Germany boundary–questions of borders are crucial to many other sites, which raise questions about the legal meaning of borders and states. Native American studies scholars have demonstrated the ways in which indigenous groups within the U.S. settler state constitute transnational communities and movements, even as the U.S. has exported its vision of the frontier to new sites of occupation. U.S. imperial formations have long relied on the ambiguity of territorial designations for colonized regions with degraded sovereignty. So when does a national border become an imperial border? How do indigenous communities contest and transgress colonial borders and produce alternative forms of knowledge about sovereignty, belonging, and territory? As scholars of colonial state formations have shown, borders are constituted not just on land, but also in the air, in water, and below ground. If populations become “illegal immigrants” without crossing a border because the border crossed them, what does it mean that borders can move and justify the violent removal and incarceration of racialized populations–who cannot themselves move freely? Stateless subjects, refugees, labor migrants, and political activists all traverse borders, in vastly different ways and with varying motivations and consequences, illuminating which bodies are un/desirable and un/recognizable. These processes of regulating mobility and inclusion are deeply racialized and gendered, and produce new and sometimes unexpected alliances that challenge dominant discourses of globalization, humanitarianism, and securitization. But these discourses also produce deep rifts and complex fissures on the ground that undermine solidarities and that make naturalized or taken-for-granted alliances difficult or problematic. Queer studies scholars, for example, have addressed the ways in which sexual freedom and gay rights have been harnessed by imperial discourses of democracy, civilization, and progress, dividing sexual subjects on the basis of religion and region between those who are modern/liberated and those in need of rescue by Western modernity. The discourse of civilizational borders has been revived to replace the discourse of racial boundaries with a new cultural discourse that is presumably post-racial, even as states use a deeply racial discourse to define which political subjects are alien/other and worthy of belonging/rights. Challenging state projects of inventing or circumventing borders from above are transnational political networks and solidarity movements. These are often animated by discourses of human rights and sovereignty as well as notions of self-determination, survival, and freedom that exceed the language of statehood. Transnational protest movements have emerged to challenge imperial and national violence and neoliberal capitalism, linking, for example, Madison with Tahrir Square and Occupy Wall St with the Palestinian youth movement. Political imaginaries of belonging that are not partitioned by national and colonial borders are produced and remade by those struggling with war, displacement, securitization, and dispossession. This initiative would help us reflect historically on old and new languages for thinking cross-regionally and forging a transnational political imaginary, for example, in the anti-globalization and global environmental justice movements. There are interesting forms of cross-pollination among these movements across national and regional borders, as well as across political concerns. How do transnational movements use technology and digital media to produce new conceptualizations of borders and new political languages of affiliation or resistance? How do transborder imaginaries rethink notions of community, proximity, neighborliness, or solidarity? What role do various forms of cultural production (video, music, social media, performance) play in these processes? This initiative has two major goals: first, to respond to the urgent need for comparative conversations about the question of borders and to interrogate the production, deployment and evasion of regional and geographic categories; and second, to bridge scholarship in area studies and ethnic studies, fields that should be in closer conversation with one another given the realities of transnationalism and the transnationalizing of these fields. 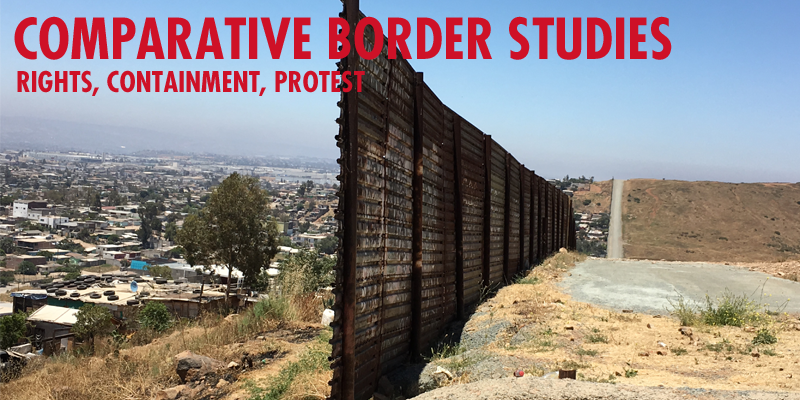 This initiative will help promote new approaches to the study of borders, violence, containment, rights, and protest as scholarship attempts to grapple with new political movements and networks that have emerged spanning Latin America, the Middle East, South Asia, Europe, and North America. These rapid shifts on the ground demand more complex theorization and cross-disciplinary, comparative research as older paradigms of transnationalism and diaspora appear increasingly obsolete or inadequate. Programs as such as the Social Science Research Council have focused on Inter-Asian Contexts and Connections in order to support new research that is needed to study region-making and regional shifts across Asia. In addition to the new ideas this initiative might offer to scholars of the US-Mexico border, in the context of Asia there is clearly a need for research on realignments of regional and racial categorizations and re-regionalization in the aftermath of 9/11. For instance, new designations such as “Af-Pak” that stretch across national borders are central to counterterrorism and counterinsurgency policies as the U.S. has attempted to remap or invent regions in the global War on Terror. A comparative approach could productively examine border zones in Southwest Asia and in the Southwest U.S. to understand deeply racialized processes of criminalization of those who transgress national borders and are viewed as security or social threats. In the Middle East (West Asia), Southwest/South Asia, and Central Asia, political, religious, and social networks have sprung up that span nation-states; for instance, transnational networks of Muslim scholars that intersect with discourse of human security or the transnational Islamist movements that have engaged in resistance to U.S. policies in Iraq, Syria, Afghanistan, Pakistan, and Libya and that, in some cases, have also colluded with U.S. interventions. Furthermore, in the U.S., the creation of new pan-ethnic and cross-regional labels after 9/11 such as MESA (Middle Eastern/South Asian) or AMEMSA (Arab, Middle Eastern, Muslim, and South Asian) have provided new coalitional categories for mobilizing in response to religious and racial profiling. These cross-border alliances co-exist with a retrenchment of ethnic and national affiliations. There is a complex interrelationship between pan-Islamic, pan-Arab, pan-South Asian, and pan-ethnic categories that in some ways recreate, but also trouble, notions of internationalist and Third World solidarity of an earlier era. These interrogations of inter-Asian identities and politics might benefit by critically introducing Chicana/o and Latin Americanist concepts of de/reterritorialization, decoloniality, or interculturality. Building on UCD’s particular strengths in border scholarship on North America (U.S. Southwest) and the Middle East/South Asia, this initiative aims to promote broader comparative dialogue on global borderlands among faculty and students focusing on other contexts, including those of North AfricaEurope, US-East Asia, Native North America, and Eastern Europe, and with non-UCD (and non-U.S. based) scholars doing comparative or cutting-edge scholarship on these issues.